With the kids home all summer and a lot of conversations with friends happening about general household chores, I thought I would take some time to focus on the basics. 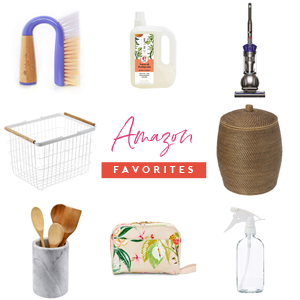 Because just as much as I love a little hack for cleaning shower heads, a great homemade cleaner recipe, or an amazing cleaning checklist, the basics are what keep our house running on a daily basis. Having the kids home from school all summer is always a quick reality check of how messy the house can get oh-so-quickly, and how important our "all hands on deck" mentality is. From beach towels to athletic gear to multiple meals a day and sleepovers galore, things can spiral out of control in the blink of an eye. The following "basics" have definitely been our glue, and although some of these tips might seem ridiculously obvious, they are absolutely worth mentioning. I have talked about this before but here it is again because it is my top tip for quickly maintaining your home: Set yourself up for success. I recommend storing your household cleaners in the primary areas of your home so they are easy to grab and use. Also, simplify your cleaners down to just what you need to reduce confusion for the entire family. Many all-purpose cleaners are just that and can tackle counters, windows, stovetops and even quick floor cleanups. Keep bathroom cleaners under a bathroom sink and kitchen cleaners under the kitchen sink. 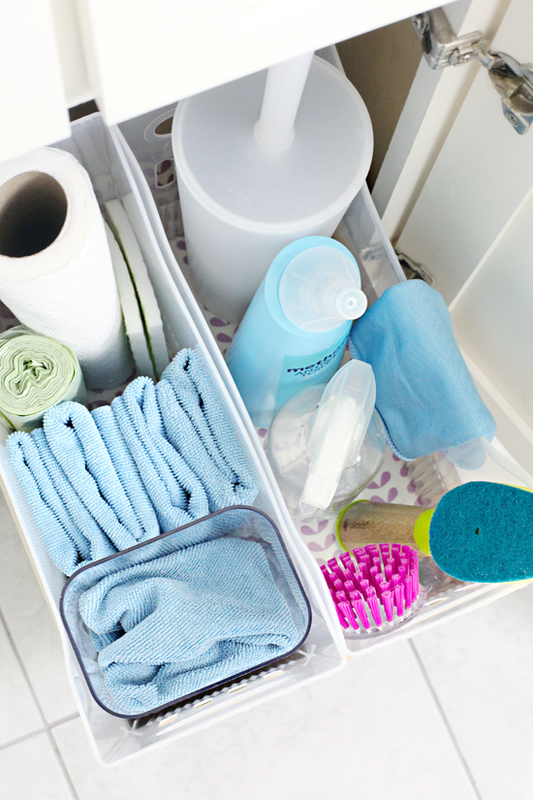 I have loved and used cleaning caddies for years now, and they are great when I am doing a bigger room-to-room deep cleaning session, but for daily battles, I like that my go-to cleaners are right within an arm's reach of the mess. I also recommend keeping a vacuum and broom on each floor of the home and storing less-used specialty cleaners together and out of the way (I keep mine in our laundry room). By removing a lot of the extras and keeping it simple, my family asks me fewer questions and are quicker to just grab what they need to get the job done. Color code the cleaning rags. 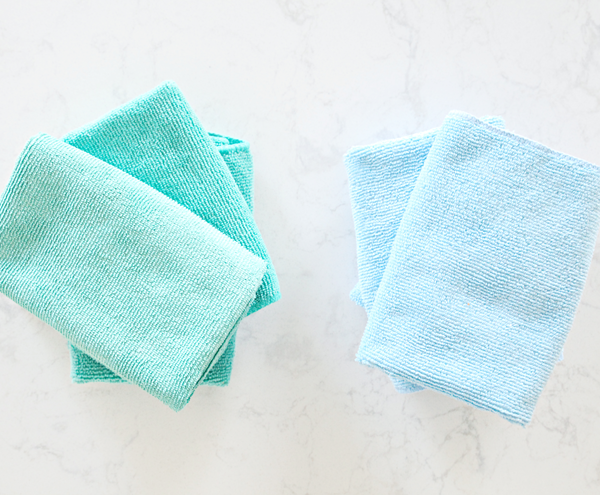 We use microfiber cloths for just about everything, and to prevent cross-contaminating the bathroom germs with the kitchen germs, I assigned the two spaces their own cloth colors. Green is used in the kitchen and blue is used in the bathroom (or for other dirtier jobs). I also added a stack of pink for our pets near their feeding station. Easy enough for all of us to remember and the rags just get stored in their designated areas. At the end of each week, the bathroom rags are washed with my mop heads and bath mats, the pet rags are washed with dog bed covers and their bath towels, and the kitchen rags and dishtowels are washed together. I always wash these items on a sanitary cycle during my Sunday linen wash day. Baking soda and dish soap can clean just about anything. 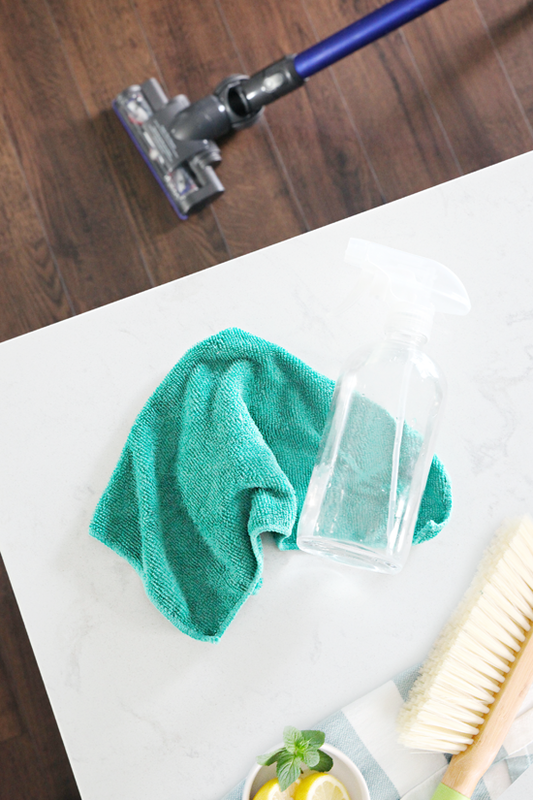 Clear dish soap makes a really great stain remover and I use it all of the time on furniture, clothing, rugs, and spills. Because it is clear, I don't have to worry about it damaging colors or materials (I always start with a small drop or two and paired with some water it typically does the trick). Baking soda is a good deodorizing agent and also helps to absorb the spill/stain/wetness. For those tougher messes (think pots, pans, baking sheets, ovens, etc...), soaking items with baking soda, dish soap and water is a major sanity saver. After cooking I always soak our pots and pans with baking soda and dish soap and by the time I am ready to wash them, they come clean with little to no scrubbing. 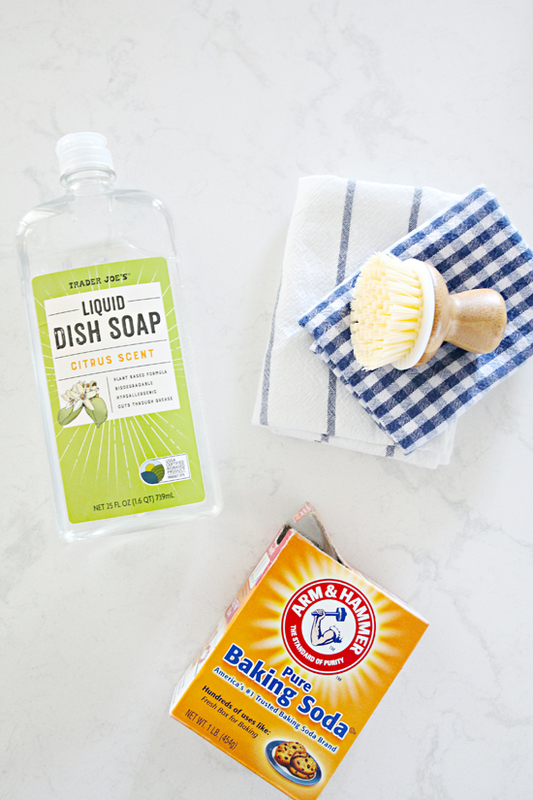 Baking soda and dish soap seem to be a powerhouse cleaner when combined, and I wouldn't hesitate to reach for the combo when tackling any major cleaning job around the house, inside or out! This general rule applies to just about any cleaning task; it is always easiest and quickest to work from the top down. Washing glass? Start at the top and make "S" motions down to the bottom. Cleaning the kitchen, wash counters and the table first, then vacuum/mop the floor. Bathroom? 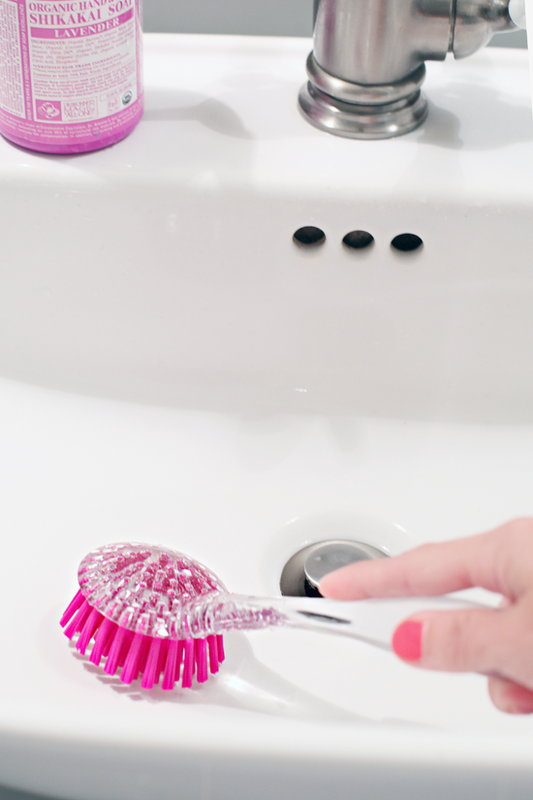 Clean the mirror and work down to the sink and counter and finish at the base of the toilet. Spraying down the siding outside, start at the top and... you got it! Work your way down. 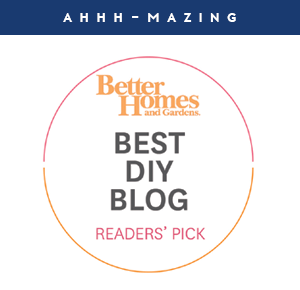 There are times when I actually encourage folks to go against the grain, but that is not the case when it comes to basic homekeeping. Washing items against the grain will bring out imperfections and may cause the surface to appear less clean than it is. It is always best to clean floors, stainless steel, wood furniture, etc... with the natural grain of the item. When the cleaner dries, it should blend right in and enhance the beauty, not fight it. 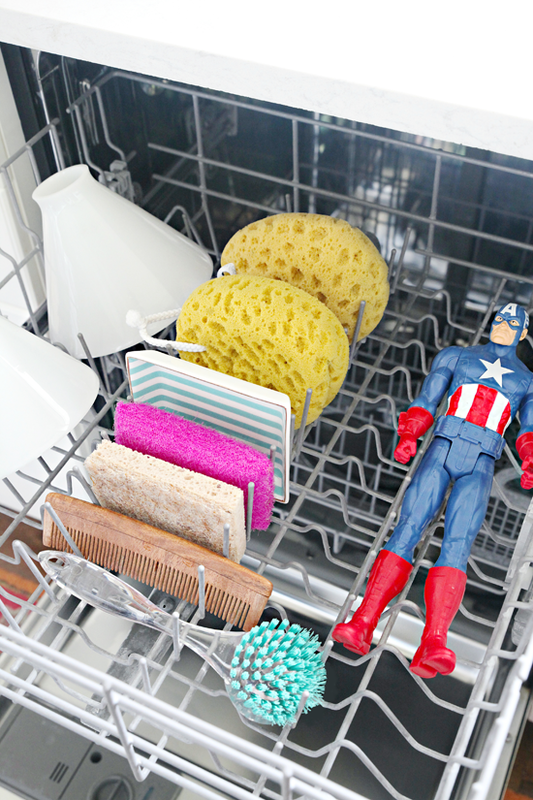 Dishwashers are not just for dishes! Of course, I say this with my use with caution warning, the top rack is usually best for anything you worry about. Avoid putting anything too precious in the dishwasher, also avoid washing anything made of wood or with a delicate metal finish. Always rinse items first to prevent clogging up your dishwasher and when in doubt, leave it out. Fold/hang clothes straight out of the dryer. A while back we decided to try something new, so straight out of the dryer the clothes are either immediately folded or put directly on their respective hangers (I just grab the empty hangers out of the closet on my way to the laundry room), and stacked in a portable basket. Same for linens. 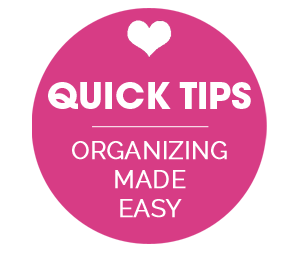 It only takes a couple of minutes and makes it much easier to put everything away right away. I also have the boys doing this with their personal loads and it has completely cut down on the piles of questionables around the house and in each bedroom. The wire baskets we use are lightweight and portable making it easy to tote around the house and return back to the laundry room (as shown here). Laundry can quickly become a monster if not managed regularly but really isn't all that hard if you just get into a good groove with it. 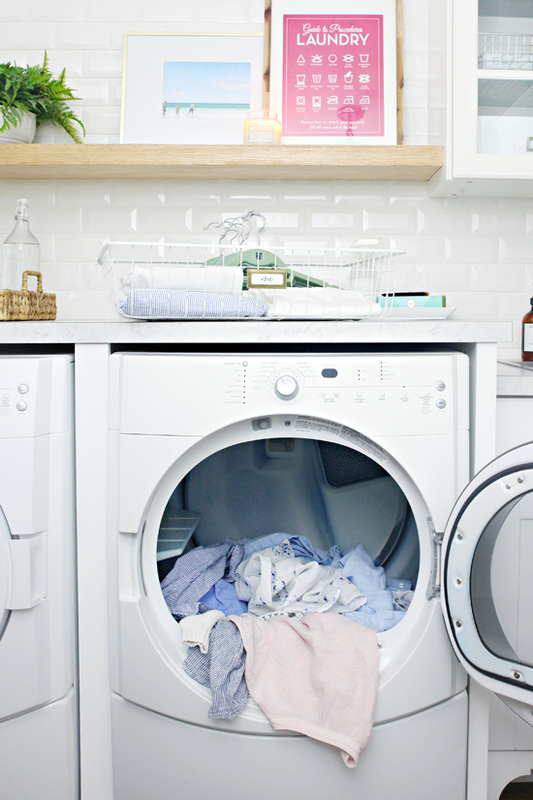 I am not sure why it works so much better for us to just deal with everything right out of the dryer (vs. taking it to the couch or our bedroom to fold), but it has been a huge sanity saver so I call it a very basic win. And while we are on the subject, giving each member of the house their own designated day to do their laundry has also been amazing. I have gotten into the habit of building some of the basic household cleaning tasks into my routine each day, which makes it much easier to maintain the home in general. For example, I wash the bathroom sink/counter each time I brush my teeth. I scrub down the walls of the shower while actually taking a shower. I quickly wipe up the kitchen counters while making my coffee. I wipe down the inside of the fridge each week when I put away groceries. These very quick add-ins really add up each week. Maybe I should move this one to the top because it might just be the most impactful. I will admit that I haven't always been a believer in making my bed every day, and never really encouraged the kids to do it either. But after it became such a positive habit, I can't imagine not doing it. It makes a huge difference in quickly pulling our bedroom together, but it also has been really uplifting to my mood. And I love leaving our bedroom door open and catching a glimpse of the tidy bed, which can be exactly what I need when I am having a messy day. Not buying it? I encourage you to try it for two weeks and check out this article (or listen to this awesome speech). It is a great basic housekeeping and life-changing task! Dang, if I could teach my kids anything about basic housekeeping, it would be that life is so much easier if you just pick up after yourself right away. And if that just isn't possible, to set aside a few minutes at the end of each day to do so. Too many times we have spent an entire afternoon on a weekend dealing with a week's worth of random piles and messes. I can think of 1,001 other ways I would rather spend a weekend day, and my family agrees. I know that some people are naturally more tidy than others. That some people can look right past a pile or mess and be completely unphased by it, while others can't focus or relax until that pile is gone. We have both personality types living under our roof and it has always been a give and take and compromise. There are definitely days when I say, "the chores can wait", and the clean freak in me has done a lot of letting go over the years. There is something to be said about soaking up the little moments in life and I know first hand that our time with our kids goes much too quickly. So cheers to playing a card game after dinner instead of stressing out about those puppy nose prints on the patio door. But the matter of the fact is that the mess will continue to be there until we deal with it, and it only snowballs if we don't. So we try to find that right balance and do our best to take care of a lot of the basics each day and to pick up after ourselves when we take things out. We also work together to do a quick pick-up at the end of each day. I leave a flexible basket hung on a hook near the stairs to corral random items that need to be brought down, and it also works great for running through the house and collecting things like electronics, mail, crafts, toiletries, socks, etc... that have been left out throughout the day and need to be put away. We always tidy up the kitchen (run the dishwasher after dinner, quickly sweep or vacuum, wipe down the table/counters) and fluff the sofa pillows before bed. It makes all of the difference just taking 10-15 minutes each evening to start the following day off right. I wish there was a red "easy" button or magic cleaning fairy that would come in and get things done while we sleep, but general homekeeping just takes some work and discipline. We aren't always perfect or on top of every mess, and we still have times when we have to play catch-up and binge clean parts of the home, yard or garage. But we continuously instill in the boys that we are all responsible for our home, and always have them help with the basic homekeeping responsibilities. I think this is one of those discussions that could really benefit from your added ideas and advice in the comments below. I hear so often that people are generally overwhelmed with household chores and keeping up with daily duties. 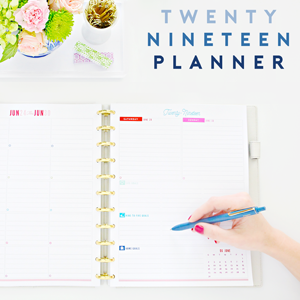 People want quick tips, shortcuts, and basic ideas to make homekeeping more manageable and less discouraging. Do you have additional ideas to share? How about small things you have added to your routine that have had a big payoff? Any ah-ha moments that we all could benefit from? Let's chat! Hi, I have been watching housekeeping / cleaning vlogs on YouTube these last few days so this is just in tune with my mood. Loved your post! So glad you brought this up, we do that in some ways as well and it works so great! Jen where did you get the pillows on your bed? The pinks and the stiped blue. Would also love to know where you got the thing above your bed (sorry cant think of the name of it right now!" 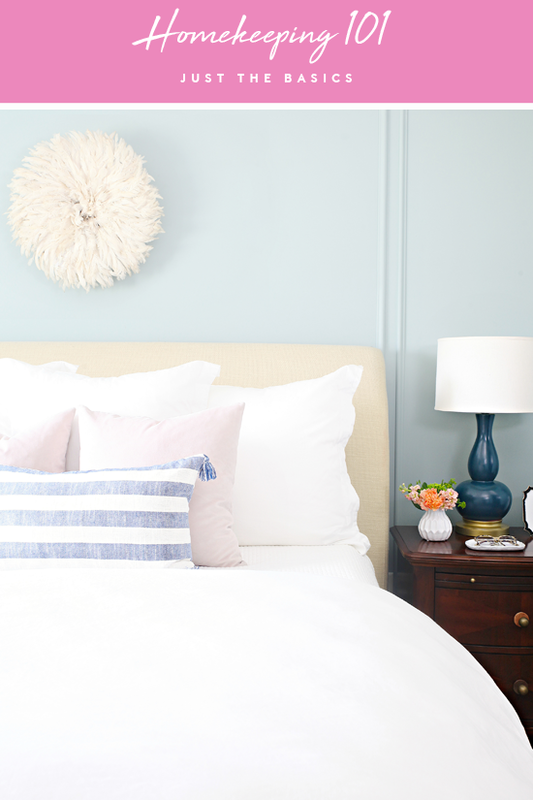 The pink pillows are from Tonic Living: https://www.tonicliving.com/products/lux-velvet-blush-pink-pillows, the blue stripe is from HomeGoods and the Juju hat is from Etsy: http://bit.ly/2BbdK73 (they come in a variety of colors and sizes). Another great blush pink velvet pillow option can be found here: http://bit.ly/2vGxASy. Hi, thanks for posting this! My kids go back to school today and I'm definitely looking forward to getting back into some routines. 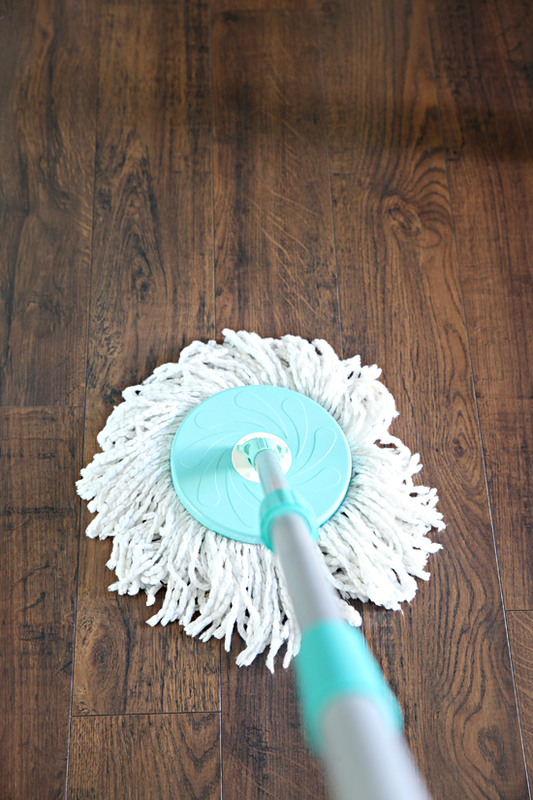 That mop looks great - do you use it for hardwood floors? I'm also wondering what your favorite wood floor cleaner is. Thanks! I use two different mops (we have laminate flooring); I have a lightweight stick microfiber mop that I use for quick cleanups and a spin mop that I use for deeper cleaning sessions (it just does a better job and gets into all of the nooks and crannies but requires a mop bucket and longer dry times). I use this recipe for my floor cleaner: 3 parts water, 1 part vinegar, 1 small squirt of dish soap, 5-15 drops of essential oil (optional). I saw you linked to the Shiwala mop--is that one you use quickly or the one you use with a bucket? The video ad I saw for the Shiwala didn't seem to need a bucket. I am in the market for a new mop--don't love the bucket method and have currently been just spraying and wiping but that's not my favorite either. Housecleaning goes completely south when my kids are home for the summer! I spend most of September deep cleaning and decluttering just to feel sane again. Having said that, I do try to stick to a FlyLady style schedule: do my basic weekly cleaning every week, and deep cleaning of certain zones on certain weeks (although this tends to be scrapped in the summer). Jen! I've missed you!! I was so excited to see your new post! And this is a timely one as we seem to be constantly battling some sort of house keeping balance! On our end, no matter how tired we are, how late it is, etc, the kitchen must be cleaned up. This means the dishes are always get done, the counters are cleaned, things are put away, etc. This has made a HUGE difference for us! I struggle with housework as a routine, don’t mind doing it too much but I just have trouble doing it when it should be done. So often the pile of laundry used to reach my waist in height! I’m allergic to a very common cleaning chemical so I had an easy excuse to avoid cleaning the kitchen and bathroom. I stumbled across the website and signed up for the daily emails and it seems to be helping me deal with the housework on a daily gradual basis rather than the usual cleaning marathons I did when things get too bad. My daily routine is get up and get dressed, make the bed, give the toilet and basin a really quick scrub and wipe down on my morning bathroom visit, empty the dishwasher from last night, put on a daily load of laundry and tackle a spot in the house that needs some tlc for 15 minutes at a time. Just getting these things done has made a huge difference to my house, it is slowly getting tidier and cleaner each week. Such a great post! I've missed your posts too! I try to make sure I actually comment more often instead of just reading. This is so needed as I have 2 under 4 and I basically spend my life cleaning up, haha! Same here, I have a baby and though I spend all day cleaning, or so it feels, at the end of the day the house is still a mess. It's very disheartening. However, posts like this one give me new ideas to try and make some progress. Thanks Jen! Loved this insight into your routine! I'm a big believer in multitasking too. As well as keeping it simple with the cleaning supplies. I really liked your idea about doing the laundry as it comes out of the dryer and I think I will test that out this week and see if it makes a difference for us. Thanks for sharing! Do you have any tips on how to get your kids to do cleaning? Involve them at a young age. I think kids learn from example and I found ways to give them small tasks and celebrate their help pretty early on (helping with laundry, running a vacuum, using the duster). One thing that was a little more challenging for me was not redo-ing their chore if it wasn't done to the level I may have done it. Try not to discourage when they do help, just encourage and teach and keep expectations lower as they are getting the hang of things. 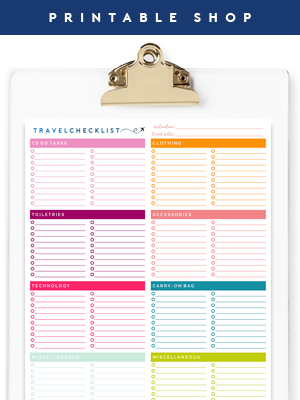 Clear responsibilities: My kids either need a list or a chore chart to stay on track with their daily expectations (at least until it becomes routine). Motivation: My kids know the first thing I will ask when they want friends or video games, is if they have completed their daily responsibilities. I was raised with a "work hard to play hard" mentality and have tried to teach my boys similarly. They know once their cleaning is done, they are basically free for the rest of the day. When our kids were younger we found ways to excite them or motivate them to help through small rewards, but eventually taught them that it is just part of the privilege of living in the house and us covering their expenses for fun, athletics, school, etc... We be sure to thank them for their help when we hand over money for the movies or purchase them a new pair of baseball cleats. Finally, if we are working on a specific bigger chore we want help with, like yard work or cleaning the garage, we give them notice ahead of time so they are not frustrated or taken by surprise. This just seems to help with overall attitude and willingness to help when the expectations are clear or set ahead of time. Can you share a link or information about the bins you use under the sink to corral you cleaning supplies! Thanks in advance! Hi there. Awesome post. Thank you! Just in time for getting back into some sort of routine as school starts. Question - since you color code your bathroom and kitchen rags does that mean that you wash them separately too? Thanks for this article on basic housekeeping. I sent the link to my son who is a college senior and just moved into his first apartment. It's a good time for him to begin building good habits. I'm taking tips from the post as well! My girls are 22 and 25 now, but we had the same probs when they were young and whiny about chores. Add in my full-time job and a landscaping hubby who completely crashes at night and likes me to hang with him...it was hard. So I created "Commercial Cleaning." We all liked to watch TV at night a few times/wk., so as soon as a commercial came on, we shouted "GO GO GO!" And everyone had to rush around and get their age-appropriate tasks done before the show came back on - and you COULD NOT work longer than the commercial. There are 8 minutes of commercials in one half-hour show, so that usually translated into 32 minutes of cleaning by 4 people....and no one missed a minute of Big Bang Theory! Lots of fun for the young-uns, lots of competitive races between sibs, and a straighten and (semi-)clean house to boot. (P.S., now that Shea and Tory are gone, I still do this...I can do anything for 2.5 minutes at at time! :) Good to have you back, Jen! Absolutely brilliant! This is such a superstar way to get everyone involved while keeping it fun! Thank you for sharing! I'm always glad to see a new post from you! I've been working hard at keeping my to-do list done, and cleaning a bit everyday. The biggest thing I've realized, is the more often I do it, the easier it gets. Less big clean ups and piles, just easy tidying. This is great! I've read that essential oils can be toxic to pets, though, so the cleaner makes me a little worried for your furry friends! Thank you for mentioning this Jessica. I only recently read that there are a couple of essential oils that should be avoided with pets, so we were sure to swap those immediately to pet safe options in areas where are furry friends hang out (we never diffuse those oils and swapped the type used in our all purpose/floor cleaner). Luckily the exposure was minimal and we heavily dilute. Speaking of kids home for the summer and the mess ... in all of my many, many communications with you over the years ( ;) ) I have always meant to ask if you felt a similar out-of-control-crazy feeling when your kids were small ... my kids are 9 and 6 now and my daughter started kindergarten last year, and it was SUCH a relief to finally have more control over my environment. And I am definitely craving the cleaning/no messes made time that begins in 2 1/2 weeks when school starts!! Were you like this?! It's weird that I don't have many memories of feeling that way with my own kids, maybe because I just grew use to the constant chaos and always had a lot of help from my husband (and also worked a lot of hours outside of the home). And I generally just enjoy daily homekeeping and would find ways to sort of "mess proof" my house based on my kids ages. But now I help watch my young nieces from time to time and wonder how I ever did it. :) It is definitely a challenge getting anything done (or done well) with little ones at your feet, especially when they are at exploratory ages or always looking to be entertained. I think it is just important to do the best you can at managing through their down times and balancing what can be tackled while they play/rest and also making sure to find time for your own self care. ♥ Those years go quick! My tip is more about removing clutter than cleaning per se, but we use baskets on a bookshelf for corralling our stuff. There are 6 of us and we each have one. Headphones laying around? In the basket. LEGO piece that got missed during cleanup? In the basket. Hair ties and bobby pins on the side table? In the basket. 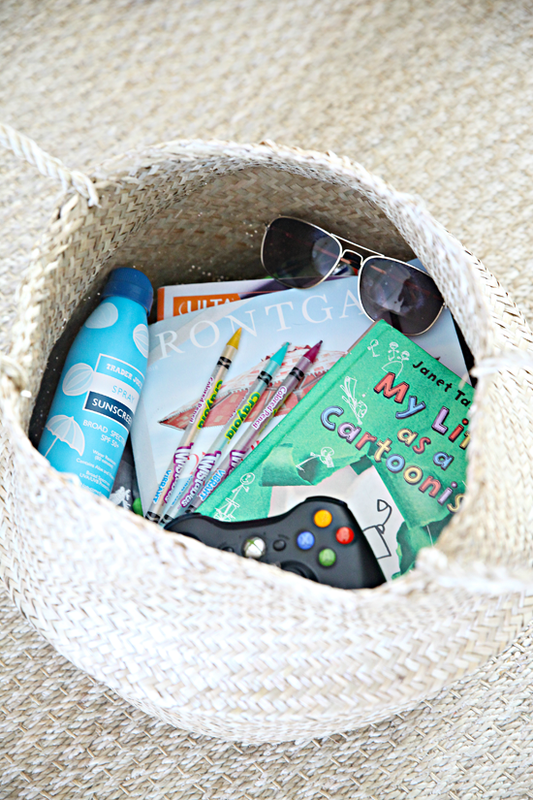 I can’t stand visual clutter, so if I find it, I put it in the culprits basket. The kids (and hubby) know to check their basket first if something they left out has gone missing, and once a week everyone puts away the contents of their basket. This tip has worked wonders for our clutter and my sanity! Such a great tip! We did pick-up baskets for a very long time and used them similarly. It worked so well! Glad you mentioned this because it is a really great way to have individuals see how much they are leaving around yet keeps your spaces clear at the same time. Love. When our kiddos were little we had a "Friday Tub." Throughout the week if you were supposed to put something away (like toys) and you didn't, mom or dad could put the item in the Friday Tub. It stayed in the tub until Friday when everything "reset." If the toy was in the Friday Tub you couldn't play with it until Friday. The only thing that didn't go into the Friday Tub was their comfort animal or blanket. Everything else was fair game if you didn't put it away when you were asked to do so. A few things: Wash from top to bottom to be sure you are not dragging the dirt and dust into the areas you just covered. Sometimes you may have to go over it a second time to be sure the cleaner dries quickly. If all else fails, clean them really well with a squeegee to be sure all surface dirt/grime is removed and then try again. I give my kids easy jobs like empty the dishwasher each morning, empty trashcans, and move laundry up or down to the basement laundry. They can organize shoes, straighten pillows and blankets, etc. I have a list in my head for when someone says they are bored:) I also rely on inviting friends over regularly... we are able to motivate for a party much more easily than everyday life! Where do you you keep the dirty/ wet cleaning rags? I loved reading this post! One thing that helps me with staying up on the clean laundry is to fold t-shirts and put them in the basket as I empty the dryer. Everything else is just tossed in the basket. Then when I have a minute to fold the rest of the laundry, it goes much quicker since "half" of it is already done! I've read so many cleaning posts over the years, but for some reason, this was very clarifying for me. I don't need to find a *new* recipe for a homemade cleaner for the shower... just to be encouraged by the simplest way to get it all clean. Thank you! Best of luck and please keep me updated! I didn't get to read this till now as we were away... but, "thank you" for responding, for commiserating, and for the tips. (I wish someone had told me brushed nickel was such a headache before we installed it everywhere. :P) I'm going to try out the products you suggested, as they sound promising! PS. Another post idea -- "Housekeeping 201: the extras"... with all the one-use cleaners/tools you need for the few jobs the basics won't cover? Hello - I always use a covered toilet brush built into a holder so the germs stay contained inside and I can store it under my bathroom sinks (similar: http://bit.ly/2vVFYgR). I keep a small amount of disinfecting cleaner in the bottom of the holder. You can also rest the brush between the toilet and lid to dry after use. I loved this post - it made me bizarrely happy in a way nothing else has during a full day's internet trawling whilst miserably confined to bed with a bad back. We're currently living in a building site (and by that I mean we have gaping holes in the walls and floors, no kitchen, a barely functioning bathroom, piles of random stuff suffocating us in the few usable rooms, and an unstoppable, neverending coating of dust and filth on everything). Just contemplating a time when my kids might be getting busy with colour coded cleaning cloths has made me smile (not least because I suspect they'll be totally feral by the time I get around to purchasing any!). As someone who is definitely no clean freak (and could be fairly described as a bit chaotic and messy), it surprises me how much this kind of stuff soothes my soul. It was the same last time we did a big renovation - at the end of a very long haul, the thing that made my heart sing the most was a little cupboard that contained a washing machine, hanging rack and two shelves of cleaning supplies ... god, I loved that cupboard! So thank you for the post - having spent all day lying here in squalor and trying to inspire positive thoughts with images of beautiful homes, turns out it's your cleaning caddy that's made me feel a bit better! Thank YOU for this comment! I am so sorry to hear that you are dealing with a bad back, especially during a full on renovation. Our large scale reno completely impacted me in ways I wasn't expecting, so I can truly sympathize. Your post is exactly what I needed this morning! One week to go until school, but I'm pumped to get cracking on re-setting the cleaning routine. Love the colored rag idea--so smart. I, too, fold right out of the dryer because it doesn't take long, and it keeps the never-ending laundry moving. I also have cleaning stuff in every bathroom and mud room and kitchen, but your ideas will improve those stations for sure--with more rags and a place to put them after. One more thought--I love my Dyson cordless, but it only lasts 18 minutes. But that's all I can stand (!) so I just run it 18 min a day which, over the course of a week, gets my entire house. Now, excuse me while I go make my bed. That's going to be my new habit thanks to your nudge :) THANKS! Oh my gosh I'm such a terrible housekeeper. I love these basic tips. Thanks! These are some great ideas, thank you! One thing I would add is, as you say, keeping the daily cleaning items close to hand- I have a pack of Dettox wipes in each bathroom so that it's easy to grab a couple and wipe the toilet over, or the worst of the toothpaste off the sink. I understand not everyone will want to use chemicals to wipe down, so reusable wipes are great too. I hear you with hanging up the clothes after washing/drying as well! I got a length of wardrobe pole installed in my utility room ( think 6ft cupboard in reality) and hang delicates on there straight from the wash, or dried clothes as they come out of the dryer. This was a wonderful affirmation post Jennifer. A wonderful reminder to keep it simple and practical so we can enjoy our life and families. I want to thank you for all the wonderful articles like this. I have been 'quietly' following, and loving, your postings since 2010. Eight years I have been happily reading all your tips, watching your renovations and coming to this wonderful happy place on the internet. I started when I had my first baby and was overwhelmed by how the clutter and chaos a new child brought. My whole organised world went upside down. 3 children later, a few moves and a house build and you are still my happy place on the internet. I applied a lot of your principles into my house build too. This is the first time I have ever commented on a post(I know! behind in the tech times). It was my husband who told me: it was about time I let that Jennifer lady know how much her positivity and skills have meant to you. I hear it enough. She has just solidified your bicarb and vinegar love! So thank you Jennifer. On the other side of the world, in a very rural remote, cliched idea, of rural Australia you have brightened and organised my world so I can have more tea parties, more lego creations and more time exploring the bush with me kids and family ... because I am not losing my mind over the chaos three children bring. Hi Jen! Where did you get the containers you use for the bathroom cleaning supplies? Great ideas! I am a big believer in making the bed every day as well... my hubby started this habit and I admit that I do think it makes a big difference! One thing I'm curious about: do you not have a toilet cleaning brush near the toilet? In Italy we keep it just by it and use it daily... If I understand correctly you use it as a tool for cleaning during bathroom cleaning day? I wanted to suggest an alternative to Jen's "wet sack" for those of us who don't generate a full load every week. I live alone (well, me, 2 dogs, & a cat) so it can be several weeks to make a separate load. I have found that I can keep both cleaning & kitchen linens from mildewing or smelling by making sure they are *completely* dry before they go in their respective bins. Same for bath linens. Every wash cloth, bar mop, & cleaning cloth gets hung to dry before it goes in the bin. I've been doing this for years in my non-AC home in the humid Midwest, & nothing mildews & nothing smells. Recommend it. And Jen, thanks. You have been a huge help to me over the years. Brittney, I have trouble staying on top of it all, too. I also follow the blogger The Lazy Genius, and she recommended an app called Tody to manage when to clean what. It costs $7 so I put it off, but I finally bit the bullet. I’m still setting it up but I can already tell it’ll be useful. You get to choose how low or high your cleaning standards are, what tasks to do (from their list or create a custom task), and how often you want to do it. Takes a bit to set it up, but afterwards it’s all automatic. And then you can just check to see which cleaning task is due now, based on when you last cleaned it. A really flexible yet efficient system. All the reviews in the app store are positively glowing. Great article! As a cleaner who does deep cleans occasionally for some of my clients I am constantly asked "how can I keep things clean on a daily basis in between visits since I cannot afford you weekly?". I ALWAYS tell them to put light cleaning into their daily schedule. I always tell them to wash down the sinks when they brush their teeth and the same with the shower! I have recommended this to so many of my clients and they are usually a bit skeptical but when I go in for my monthly cleans I can see the difference! It truly is the little things like this that make such a difference. I will definitely be sharing this article with a few of my clients! Make your bed every morning and set this as a precedent for your children-this was a HUGE uphill battle but I finally got my oldest to start and she now says she feels more compelled to clean her room to match! :) It's oftentimes a mindset change! I like how you included your family in the plan. In my experience, that's the only way to win the war - everyone has to chip in. These tips are great. A lot of them aren't new to me, like making your bed every day (https://www.precisionchemdry.com/6-helpful-home-cleaning-tips/), BUT they're still useful. I need to be reminded, and I'm sure I'm not the only one.